Mydock can't remember ever not having a desire to draw, colour or paint pictures. He drew on his bedroom walls, repainted his toys and made new forms from old, taking things apart and 'remoulding' them. To him the wonder of art is to create something out of nothing, and this has always given him a sense of magic. His knowledge and skills, however, have not been simply granted; they have come through years of observation and practice. Growing up in Miami, Florida, in the l950s and 1960s, he was apprenticed to his godfather, Myron Hopkins, who repaired and built classic Chris-Craft mahogany speedboats and cabin cruisers. This basic training laid the foundation for his skills in tool handling and bandsaw work. By the age of 14 Mydock was brushing crystal-clear varnish finishes on trims and transoms; by 19 he was a master at spray finishes on boats. This led to restorations on motorcycles and classic cars. His passion for art was cemented at college, where he majored in sculpture at the University of Miami and painting at the University of Florida, under the guidance of Duane Hansen and Richard Heipp. He credits his college professors with "awakening my abilities and lighting the fire of creativity within" and goes on to explain: "In 1970 Duane encouraged me to open my first Mydock Studio and pursue my passion. Richard encouraged quality, not quantity in my artistic endeavours." So it is that Mydock came to woodturning through a side door - painting and finishing - and believes he was tricked into the trade! Fresh out of college, his studio brought him opportunities to supplement his income by putting his 'yachting' skills to good use, airbrushing, lettering and pinstriping motorcycles. In 1986, he was commissioned by the Paul Mitchell hair company to paint their Solar Race Car in Hawaii, and for the next decade, he split his time between Hawaii and Florida, before finally moving to the Big Island of Hawaii full-time in 1998. He made a name for himself spraying pearlised finishes on custom motorcycles for the local Harley Davidson shop and for many years he displayed his art in local galleries on the Big Island. "At that time my signature work showcased my pearlised finishes on hand-sculpted wooden mirror frames. Dennis Hakes, a woodturner who displayed his bowls in the same gallery, approached me one day and asked if I would put that same kind of finish on one of his vessels. Of course I said yes. 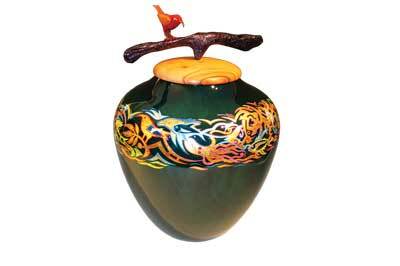 I had been thinking how easy it would be to airbrush a bowl that was already sanded and sealed." 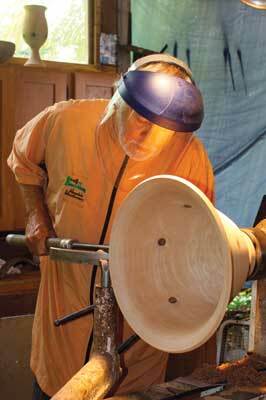 That first bowl led to more collaborations with Dennis and several other members of his woodturning group. "One day I took a vessel to an upscale gallery on the island. When I showed it to the owner, his eyes lit up and he asked me to bring 10 more." But when Mydock went to Dennis with the news, suggesting he turn the vessels for him to pearlise, the response was not what he was expecting. "He said he had moved and did not have his workshop up and running. He offered me his old lathe and told me to start turning." "I had spent a little time on a lathe, but nothing to write home about." Elmer Adams, one of the true Master Woodturners on the Big Island, offered him a six-day, hands-on apprenticeship including all the basics and safety instructions he needed to get started. "We spread those six days over two weeks, allowing time to practice and integrate the teachings. I walked away with nine vessels, which all sold at the gallery. I thought, "Wow, I can do this." I was bitten and forever infected by the 'lathe bug'." Mydock tells me that he also enjoys 'old master analysis', deconstructing and copying their work for practice, and then applying the techniques in his own pieces. "Artists such as M C Escher and Albrecht Durer provide a wealth of knowledge for the curious pyrography artist." 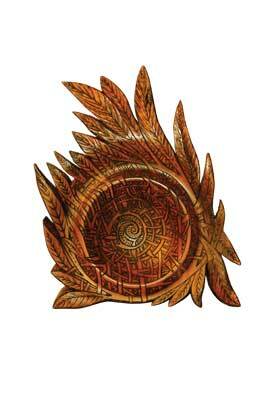 He also weaves patterns of Celtic symbols and Tibetan endless knots into his pyrography designs. In a word, Mydock is known for embellishment. 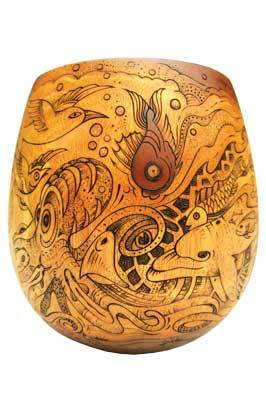 His signature style is his pearlised finish, though he is moving more towards pyrographed designs. As he notes, his pearlised finish "creates the illusion that the vessel is made of glass.' He is still a boy transforming his toys and working his magic. And he is still in love with drawing and art. 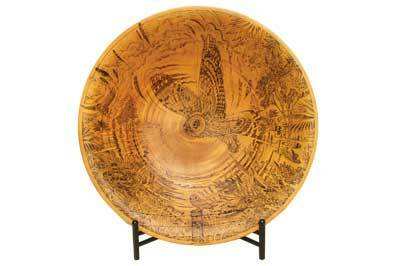 "I like to turn platters with a wide rim, which provides a comfortable zone for pyrography. Even the sides of vessels have become a canvas for my art." Regarding turning, he has explored many different techniques. 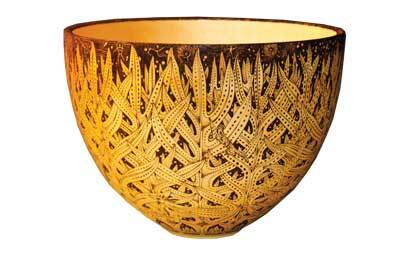 "I started with simple turnings - salad bowl shapes, vases and calabashes. To add some flair, I started to carve and sculpt." Mydock is not short of praise for his mentors, and is quick to acknowledge the guidance of others. "The greatest mentors are those who bring out our best and complement the path we have chosen." He credits Elmer Adams, Dennis Hakes, Gregg Smith and Kelly Dunn, to name just a few from his local clubs. From further afield he mentions Mike Mahoney, for speed-turning a salad bowl; Graeme Priddle for unique metaphors with a personal touch; Jacques Vesery for encouraging him to 'burn my own visions'; Jimmy Clewes for his ease of making platters and J P Fennell for embellishing by piercing. Over the years Mydock has designed and built many studios, which, he tells me, "just keep getting better, more streamlined and equipped". At 66, he is now in his ninth studio-home, and knows precisely what tools he can't do without: "First my Oneway lathe, then sanders, grinders and Burnmaster pyrography tools. They all work magic." "My workshops always tend to be somewhat organic in growth. I usually start with my house and living quarters first, then add another roofline off to one side and slowly start closing it in with walls, large double doors and windows for my studio space." He now has the luxury of two workshops. One is a covered, open-air workspace for his lathe with a 4.5 x 6.7m storage area for logs. He describes to me the tropical breeze that sweeps through, blowing the chips and sanding dust away. In Hawaii, with an average year-round temperature of 15 to 30 degrees C, rain is his only concern, and when it falls, he just lowers the tarp walls. "I've built cabinets for the lathe tools and sandpapers to keep them dry and organised." His other workshop is a little larger, at 4.8 ? 9m, and in it he keeps his tablesaw, planer, chopsaw and radial arm saw, which he uses for furniture and cabinetmaking purposes. It has dry storage for plywood and lots of lumber on racks under the workbenches, along with several large cabinets for the many hand tools and supplies he collects along the way. It also contains a small spray booth for applying pearlised finishes to vessels. Mydock shows no hesitation in answering this -developing his skills in lathe art. "The recognition from my peers cheering me onward and upward to pursue this highly creative art form has been a real source of joy and inspiration." As to lows, the only comment he can offer is: "Why didn't I discover woodturning sooner?" Mydock tells me that, as an artist in Hawaii, his life has been about creating something new for the next juried art exhibition. He enters between 10 and 15 shows each year to promote his work. These shows include the annual 'Wood Guild Exhibition' and 'Big Island Woodturners Show', along with furniture exhibitions, portrait challenges, plein-air art shows and recycled art shows on Big Island. Most important to him are the 'Hawaii Craftsmen Annual Exhibition' and the Hawaii Forest Industry Association's exhibition. "All of these exhibitions keep me turning and creating new work on a regular basis. I just have to decide how busy I wish to be," he tells us. Mydock also finds that giving demonstrations is a good means of self-promotion, as well as a way of passing on information. He has now given four pyrography demonstrations for various woodturning club chapters, with more in the pipeline for future events. "This is the key to the next door," he tells me, 'to give back to others who have given so much to me." Mydock currently has four vessels in the State Foundation on Culture and the Arts Contemporary Collection and another has just received the Recognition/Purchase Award by the Honolulu Academy of Art Museum. Recently, Robert T Soppelsa, Senior Curator for the United States Art in Embassies Program selected two vessels from his portfolio to be placed in the American Ambassador's residence in Canberra, Australia. Agriculture in their 'Art About Agriculture Exhibition'. For Mydock, there is a huge range of time it takes to complete a piece. Size is a big factor in determining the time required - the larger the vessel, the more room there is for pyrography designs, and hence the amount of time he dedicates to this increases. A vessel may take him anywhere between 30 and 100 hours to complete. Typically, a 460-510mm rim design requires two days of drawing and layout, plus six to 10 days for burning the designs. "If I pearlise a vessel with my automotive finish technique, I need 40 to 60 hours for six applications of spraying multiple coats, with fine sanding between applications and buff polishing for that glasslike mirror finish." This process usually takes about a month due to the time required between coats for the catalysed finish to cure and harden. "My aim is to complete 500 'wow-factor' bowls in my lifetime, and to share my visionary lathe art with a larger audience." But whatever the future holds, from all that we have discussed and all that I have seen, it is clear that creation will remain the driving force behind his work. Everything about his work is an expression of this, be that through turning, burning or painting. "It is who I am. I make things. I love the creative process." So while his themes and applications may evolve, his pieces will remain for art's sake and not utility. These days he tends to work at a slower pace, preferring to make a few high-end pieces rather than dozens of smaller vessels. "My current passion is pyrography designs. I love drawing tattoo-style art." The spontaneous creativity that woodturning allows is something that I prize highly. Often I see the object in the log first, then the Zen-like meditation to liberate the vessel is freedom released into the unbounded. With my lathe art, I can make great gifts of love for family and friends, as well as for clients and patron saints of the arts. Most importantly, the joy one receives from making lathe art is worth more than gold! Only that I did not discover lathe art earlier in my career â€“ what an amazing way to create art from the heart!